Framed Poster Drinks in sketch style. Useful natural juices and smoothies. Poster Seamless pattern of watermelon slices. Vector summer background with hand drawn slices of watermelon. Vector. 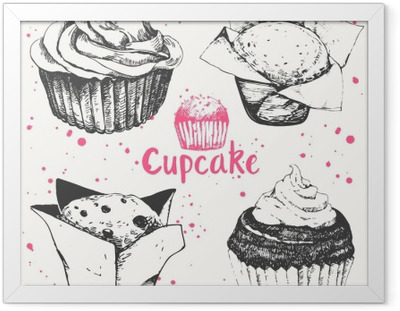 Framed Poster Cupcakes and muffins. Set of hand drawn cakes. Poster Coffee, Illustrated Quote - I like coffee because it gives me the illusion that I might be awake. Framed Poster Seamless pattern with doodle coffee beans isolated on white background. Poster Collection of cute Summer ice creams. Summer fun poster. Framed Poster Top view of the pastel marshmallows on a pink background. Minimal style. Poster Lollipop and Marshmallow in the line on blue and pink backgrounds. Poster Summer seamless pattern with ice cream and banana in retro style.